I was sent a robot and a dancing hippo to review from Lamaze. They are really good quality as are all lamaze toys and lots of fun for little hands to explore. Here is my tester Harry (nearly one) getting to know Rusty the Robot.Rusty has a turning head allows you to mix and match his body, he has crinkly bits, ribbons, clanking rings, busy beads, and a discovery mirror. Lots to explore, so tactlile and great to look at too. Harry spent a large part of a lovely sunny afternoon picking up , pressing, stroking turning and thorughly exploring this interesting and easy to handle toy. He really enjoyed it. 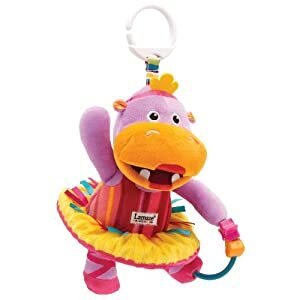 This is Lulu in a Tutu, a colourful dancing hippo also part of the new range from Lamaze. I think she is adorable . She has a a crinkly tutu, busy beads, colourful ribbon, lots of textures and a rattle too. Like Rusty she has a link to attach her to play mats, nappy bags and buggies. I have attached such toys to toy boxes in the past too..the plastic bucket type with handles. I have a lot of Lamaze toys for my two, the quality and durabilty has always been outstanding. These retail from about £8-£10 on Amazon, John Lewis, Kiddicare and lots of other toy and baby product shops.They are recommended for babies and young children of all ages designed in conjunction with child development experts.